Observation - Mallard - UK and Ireland. 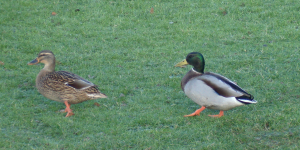 Description: Female and male mallard posing for the family album. Beautifully coloured duck, even the female though dull & brown is intricately patterned. Female and male mallard posing for the family album. Beautifully coloured duck, even the female though dull & brown is intricately patterned.